In Dimentiara, potato eats you! With its many eyes, its vision encompasses the entire electromagnetic spectrum: not only can it see visible light, it has X-ray vision and can see into the ultraviolet and infrared spectrums. Once this savage spud spots its prey, it will hide underground to wait for its victim to approach. Then it will pop out and slash it to pieces with the blade-like thorns on each of its branches. It can remain hidden underground for weeks at a time if it needs to. For some reason, the thing I’m most drawn to in this design is the fact that the blade-arms really, genuinely do feel like specialized branches tipped with thorns. I think it’s the coloration, coupled with the extreme curl of the thorns themselves. Updated Comment: Okay, I just looove Bladetayto!! This kreature is why I enjoy a series or projects featuring monsters such as yours. 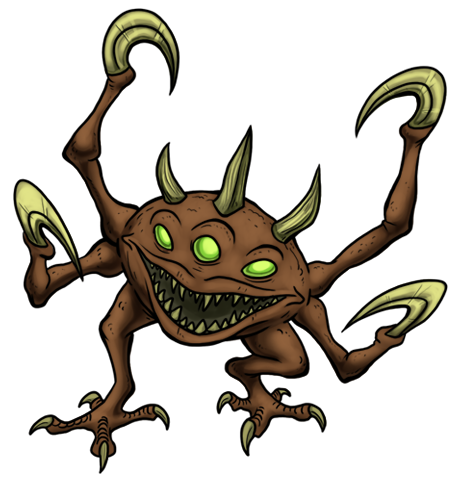 A giant potato monster with three eyes, four arms ending in blades, clawed feet, and razor sharp teeth. Anything goes!! It’s just brilliant!! !